Who doesn’t love chicken and dumplings? I certainly do! I’ve been contemplating trying to make some from scratch for a few months now, but it’s something I never have quite gotten around to trying yet. More recently, though, I started wondering if I might be able to at least come up with some sort of reasonable facsimile using shelf-stable ingredients I already had on hand (which wasn’t much at the time of this experiment). It seemed like a pretty tall order at the outset, but I was actually pleasantly surprised by the faux “chicken and dumplings” I was able to produce through, well, basically SHEER FORCE OF WILL. First, put 5 cups of water in a pot on the stove and set it to medium or medium-high, depending on how impatient you are. Take 1 cup of water and microwave it for a few minutes in a suitable container (I used a Pyrex measuring cup) until it reaches a rolling boil. After the microwaved water is boiling, add 6 tsp. of chicken soup starter powder and stir until dissolved. The Orrington Farms soup base ingredients are salt, dextrose, food starch-modified (corn), chicken fat, monosodium glutamate, spice, coloring, soybean oil, disodium inosinate and disodium guanylate. Just like mother used to make, huh? I’m not an MSG fan at all, but at least it doesn’t contain hydrogenated oil and I doubt it’s any worse than ramen powder. 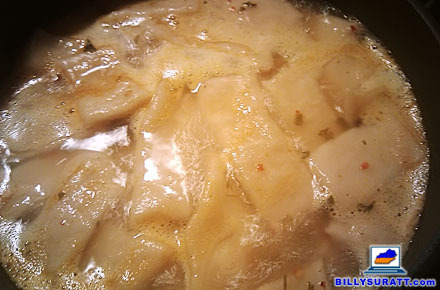 After the soup base is dissolved in the boiling water, add it to the pot on the stove. Then add the dried parsley, garlic powder, crushed red pepper, BAM! Burger Seasoning and Rotisserie Chicken Seasoning. Parsley is a pretty much useless herb with basically no flavor or nutritional value whatsoever, but I find it’s really good for making things seem more savory. Nothing says “savory” like little green things floating around in broth, especially if it’s chicken-looking broth. One warning: This stuff is pretty spicy. Like, Szechuan spicy. I like spicy, though, plus we’re making soup out of a bunch of dried crap dissolved in boiling water, so dulling your taste buds by setting your mouth on fire with chicken-ish pepper water isn’t necessarily a bad thing. Once you’ve dumped everything in the pot, bring it to a boil, reduce heat to low and put a lid on there while it’s simmering so the water won’t evaporate too much. If you let the water evaporate and it reduces down, it’ll be even hotter. Again, not necessarily a bad thing, just something to keep in mind. I don’t pretend to even halfway understand The Physics Of Dough, but basically just keep smushing the stuff around until it seems, I don’t know, doughy enough. Then pat it down, take out a rolling pin, cover the rolling pin with flour and start rolling the dough out to about an eighth of an inch consistency. Maybe two-eighths of an inch; this is not an exact science. Basically, you want the dough to be thinner than a doughnut but thicker than paper. 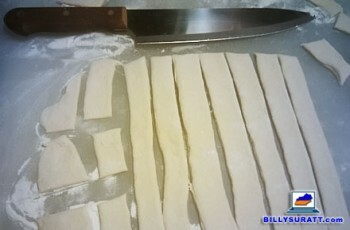 After the dough’s rolled out properly (if it stuck to the rolling pin, you did it wrong and it isn’t rolled out properly — spend a few minutes throwing more flour around the kitchen), take a knife and start cutting it into dumplings. I like the pieces to be about an inch wide and a couple inches long, but feel free to get creative and whack ’em up however you like. For instance, with the holidays fast approaching, you might like to try cutting out some dumplings in the shape of a heart or Abraham Lincoln. Go nuts. After you’ve chopped up the dumplings, drop them in the simmering broth, put the lid back on there and let the stuff cook until they float. Then let it cook a few minutes longer. Again, this is not an exact science; just cook the stuff until you’re tired of cooking it and/or about to pass out from hunger. Let it rest for a few minutes after removing it from the heat. If you used Orrington Farms Chicken Flavored Soup Base & Food Seasoning like me, now take a fork and skim off the bit of nasty-looking film congealing on top and discard it. I assume that’s probably just chicken fat, but I’m not eating it. All done! Ladle your faux chicken and dumplings out into a bowl and enjoy. I’ve made this recipe a couple times now and while it’s not something I’d want to eat very often, it’s surprisingly tasty in a pinch (like if you’re in the middle of a snowpocalypse or nuclear war and can’t get to the store for better ingredients). Adding a can of chicken or perhaps even some peas and carrots could easily take this recipe to a whole other level, not to mention making it more nutritional(ish). For what it is (chickeny boiled pepper water with some dough floating in it), it’s surprisingly tasty. It’s undoubtedly high in sodium, though, so if you have high blood pressure or need to limit your sodium intake for some other reason, please don’t eat this or you’ll probably die (disclaimer: not my fault). My review of Kroger's "Wholesome @ Home Meals in Minutes" store brand Cajun Style White Meat Chicken and Chorizo Gumbo.